1st WKT down. Hassan get S.Hasan. No Tait Ab Bhi nhi jeeta karachi kings Th L... Ha pphr !! طارق بن زیاد کشتیاں جلا کر نکلے تھے کراچی والے آج گٹکے کی فیکٹریاں جلا کر آئے ھیں ???? 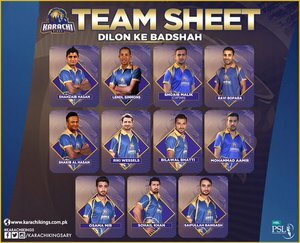 What a day #KarachiKings has choose to give a chance to #shahzaibhassan !!! OUT! Hassan picks his first wicket. Shahzaib goes back to the pavillion. Who you want to qualify for next round.?? And the youngster #HassanAli takes out #Shahzaib with the help of @KamiAkmal23 ! KK are playing street cricket ???????? Hardly making bat ball contact. ???????? And the youngster #HasanAli takes out #Shahzaib with the help of keeper @KamiAkmal23 ! #BOOMBOOM @SAfridiOfficial 's over is up next!